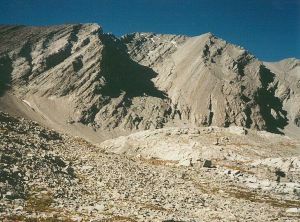 This peak is #15 in Prominence List for Alberta .Mount Galatea is the highest point in the Kananaskis Range. On a clear day it is possible to pick out peaks as far away as the Purcell Mountains. The Mountain has an impressive NE face which rises above the head of Galatea Creek. There are no official routes on the face, but no doubt it offers good Alpine Climbing opportunities that conform to one of the Rockies standards, loose rock on a big face. The south slopes sit above a beautiful Alpine valley known locally as the Three Lakes Valley. The scrambling route goes up these slopes and is rated difficult. The slabs below the South ridge are quite steep, and the final section of the ridge to the summit proper is fairly exposed. Name Notes: Named in 1922 after the HMS Galatea which as the flagship of the First Light Cruiser Squadron. In 1916 during World War it was the first ship to open fire in the Battle of Jutland.